The Savannah only looks wild — this breed tends to be affectionate and clownish. If you’re attracted to the call of the wild, you just might be attracted to the Savannah, an exotic-looking cat who often has a confident and charming personality. He tends to be friendly and can even get along with kids, other cats and cat-friendly dogs if he's raised with them. It's worth noting, however, that he might not be the best choice for the first-time cat owner, as the combination of intelligence and high activity level can challenge some people’s patience. Learn more about the breed and whether it might be the right one for you. They tend to be intelligent. The Savannah is generally smart and curious and often enjoys the attention that comes with being clicker-trained. Challenge his brain by teaching him tricks and games and reward him with kibble or treats when he learns something new. The Savannah is a cat who will probably be happy to curl up with you — or on you — in bed at night. He may even get under the covers with you if he’s cold. They’re known for their athleticism. The Savannah is an active cat breed and he tends to be a climber — the higher the better. Give him plenty of cat trees and window perches. They can have a sense of humor. Remember that climbing ability we mentioned? Don’t be surprised if the Savannah decides to playfully push something down at you from his perch. He might like to hide, assuming you can’t see him, and tag you when you’re not looking. Or he might drop a toy into your favorite drink. They come in many colors and patterns. 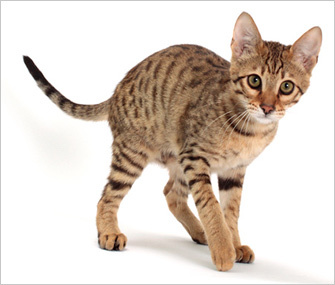 The Savannah can be black, brown spotted tabby, black silver spotted tabby or black smoke. Black Savannahs are solid black but may have faint “ghost spots” that can be seen beneath the black color.